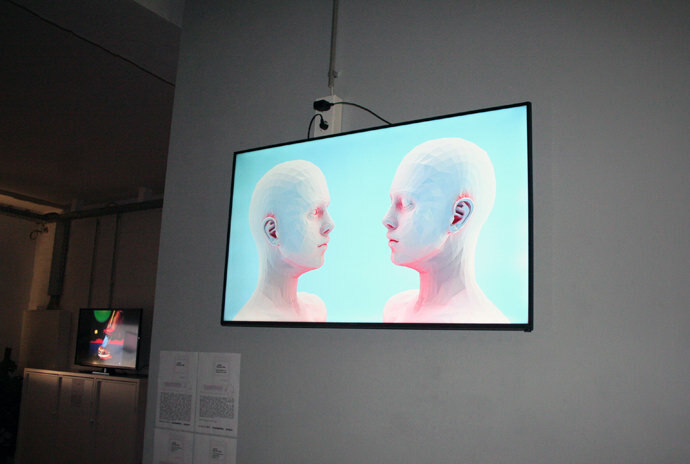 Curated by GIRLS & KALTBLUT Magazine teamed up for “Digital_LUV♥”, an exhibition that explored our close and intimate relationship to Digital and to each other. The show took place at Kreuzberg’s Blogfabrik on December 10th and 11th 2016. Digital is constantly part of our everyday life but it seems like we are less and less connected to each other, that we hide behind our machines instead. The aim of Digital_Luv♥ was to invite you to discover and feel the relationship between us Humans and digital. The IRL show showcased 12 Artists, whose work explored the themes of love, diversity and freedom, through various aspects of the actual world of digital technology: Gifs, animation, graphic design, 3D, Vj, Hologram… Obviously, the 12 artists exhibited have different perspectives; Some purely interested in creating beautiful images that let you decide what you wanted to see, and some more involved in the important fights like the image of woman in art, gender identity, the representation of the human body, androgynous or even posthuman body. (Live Performance), Matthieu Schmit, Chloé Guerbois & Alex Forge @GhostRaum. Sponsors: Lomography Deutschland, WARSTEINER, Our/Berlin Vodka, Michelberger’s Fountain of Youth, MAKAVA delighted ice tea, Tonverleih, Burmester Event & Medientechnik, INVR invr.space, 360camrent, PERLENSÄUE, Mancheck, Erika Lust Films, Look-O-LooK and Google. All Photos by Marcel Schlutt.